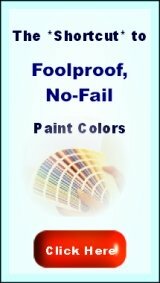 Usually, interior paints are highly chemical substances and we accept it. But sometimes you might want to have a non-toxic paint (for example in the nursery, kids rooms, bedrooms, bathrooms), or - when you're pregnant and painting. You might want to maintain a susbainable lifestyle, or simply have a more natural kind of paint. Egg- and Caseine-tempera paints were used in the oldest painting techniques (ancient Egyptian tombs and Italian dry fresco). Caseine is made of milk, eggtempera is simply egg. Egg-tempera is 100% non-toxic, and caseine-tempera is getting close. 100% non toxic:Milk paint (wood, walls). This is an instant product (ready to use when mixed with water). 95% non toxic: Caseine paint. 60% non toxic: Shellac paint. During the painting job, it's high on VOC, but when dry shellac is considered safe for children's toys and furniture. 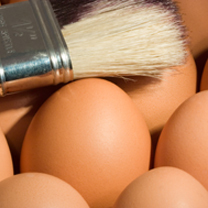 Egg and caseine are good for walls and untreated wood. 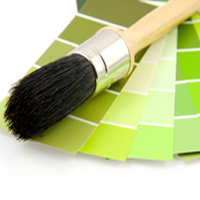 Ready-made sustainable paint for wood can be milk paint, or organic oil based paint. 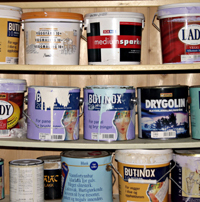 Oil based paint goes over oil based paint, and milk paint goes over latex or untreated wood. Acrylics are nice because they're water-soluble, but they're still highly chemical and still exhume gases, long after they've dried. Bees wax is an interesting option for art painting, but on itself not suitable to apply to interior painting - or maybe as a shiny finish over latex- or milk paint. Scroll down for that. 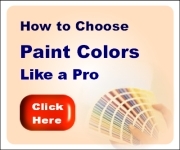 Click here to find a website on non-toxic housepaint. Here you can find organic oil-based paints too. In terms of regular house paints, acrylic paints were a good step towards getting more healthy paints. Still, acrylics are very chemical substances. Latex is a rubber which is more natural, it breathes too, but it shouldn't be swallowed. Acrylic paints are known to exhume funny gasses long after they've dried. Paint is made of a pigment (dry color-powder) and a medium, a 'glue'. Both should be non-toxic - and some pigments are verytoxic. Cobalts, manganese colors, cadmiums, phtalocyanine and flake- or cremser (lead)white are all poisonous. This list contains about all the colors you need. For more info on pigments, check Ralph Meyer's book on artists' materials and techniques - it has all the information and is available at Blick Art Materials . A painting idea for kids: give them some (non-toxic) pigment paste, or even kitchen spices like curry and pepperoni powder, and let them add some milk to them - and voila, you have made paint. Egg-yolk and caseine are good for wall painting techniques. Bee's wax or encaustic is also an interesting option. It's done on panel and you can already guess it: you need a heated steel palette, and palette knives to work with. Bee's wax can be turned into a polishing agent, by adding potash (kalium carbonate). Potassium is slightliy toxic (it might irritate the skin). It turns the wax to a very fat 'soap'. You can apply it on the tempera with water. It still looks matte then. When, after drying, you rub it with a cloth, it will attain a high-gloss - just like shoe-polish. 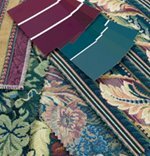 Shellac is a unique material - it can be used on difficult surfaces like laminate, glass, or ceramic tile. It can only be painted over with latex paint or oil-based paint. Shellac is a very pure and non-toxic substance, but it can only be solved in pure alcohol. That's what makes shallec paint a less non-toxic paint, but this toxicity ends when the paint is dry and the jar closed. In that way, shellac is a good alternative to acrylics. 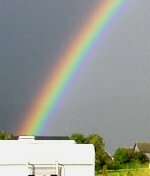 Safe paint colors in all color groups!